Like everything to do with weddings, the whole traditional side of wedding cakes has changed in recent years. The designs of the cakes have become simpler, as well as much more elaborate. The choice of colours available nowadays is so numerous that it can be hard to choose from. Spend five minutes on Pinterest and you will get showered with ideas for wedding cakes! Not so long ago, the typical wedding cake would be made of fruit cake which can be stored after the wedding without it starting to ‘go off’. The couple would keep the top tier of the wedding cake and cut it at the christening of their first child. This tradition slowly changed in recent years. More and more wedding cakes now have modern flavours, such as chocolate, or red velvet. However, some couples might still want a traditional fruit cake as part of their wedding cake. They simply opt for the top tier to be made with fruit cake. You may also want to check out 160+ wedding cake ideas (all the wedding cakes I have ever photographed) - Link again at the bottom of the page. So what are the top 7 wedding cake flavours? Hmmm… red velvet, the colour of love after all! Red velvet cake is usually a deliciously moist cake, with hints of chocolate flavour and some creme frosting. Most wedding cake designers can make a red velvet wedding cake. Who doesn’t like chocolate cake? There is white chocolate, milk chocolate, praline, dark chocolate, you name it - it can be done! Chocolate is one of the most popular choices for wedding cake. You can even go a few steps further and enrich the cake with orange, mint, strawberry or lime. Lemon wedding cakes have become more and more popular over the past few years. The lemony citrus flavour is perfect for spring and summer weddings. The cake is usually light, and not too rich. Imagine adding strawberries or raspberries to the mix! You will have seen different ice cream flavours, such as lemon and strawberry ripple! Imagine that in your wedding cake! Vanilla is a more traditional choice, and if you want to have a cake that pleases everyone in the room, you cannot go wrong with a vanilla wedding cake. Vanilla cake on its own is very tasty, but you can also add berries or fruit. Coconut is one of our favourite cakes! Whenever we go to a cafe, we seek out the coconut cakes! Our own wedding cake was half coconut too. Imagine combining a rich and creamy coconut wedding cake with a zesty lime filling… you will lick all your fingers! Carrot cake is another great choice for couple who like a dense and moist cake, that contains carrots as well as nuts. The creme frosting usually brings out the flavours of this delicious cake. A fruit wedding cake is made with candied or dried fruit, nuts and spices and sometimes the cake is soaked in alcohol so that it can be preserved for longer. It has a very rich and dense texture and is a more acquired taste. You don’t need your wedding cake to be just one flavour. If you’ve ever been to a wedding cake tasting you will come away with a big smile, crumbs in the corners of your mouth and undecided which cake choice to have for your wedding cake. So why not combine them? 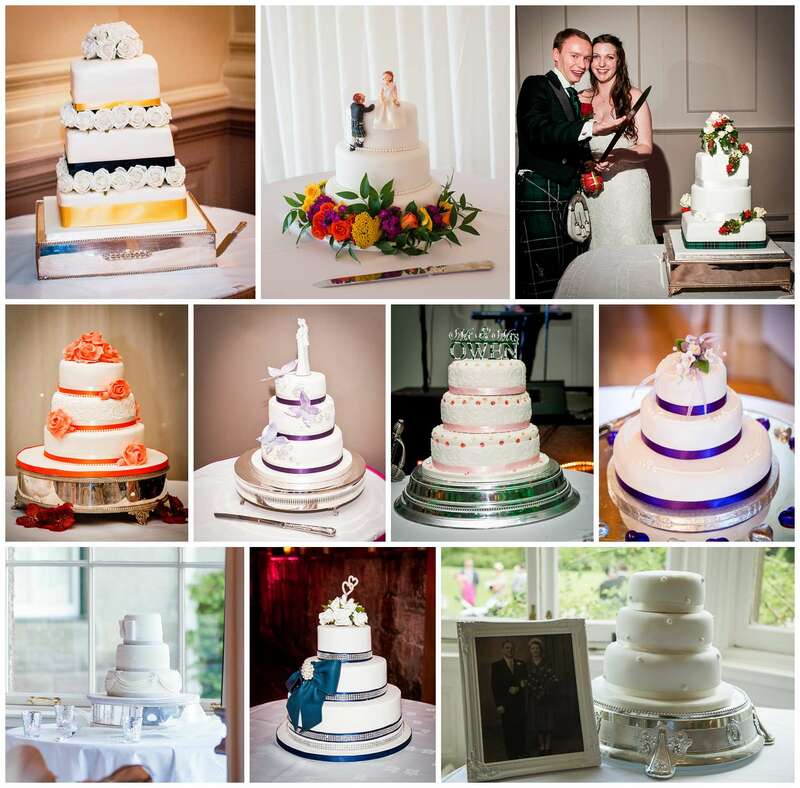 Many couples have different flavours in their wedding cake. You could have the bottom tier in vanilla, for example, the middle tier in chocolate, and the top tier in traditional fruit cake or something else. Any option is possible really! And if you want to read about a new wedding cake trend and its pros and cons, check out my article "What you should know about naked wedding cakes"
You may also want to check out 160+ wedding cake ideas (all the wedding cakes I have ever photographed).